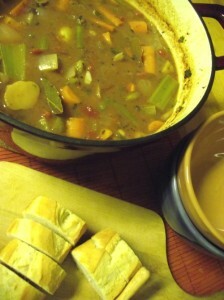 This is a delicious rustic stew that is perfect for family style dinners no matter how big the crowd is. Set it out with a giant bowl of garlic mashed potatoes and some crusty bread and you’re all set. Feel free to throw in any other vegetables you like- mushrooms, green beans, whatever. Melt the butter in a large oven safe stock pot or dutch oven, add salt, pepper, garlic and meat. Cook over medium high heat until meat is browned. Turn down heat and then sprinkle with flour and cook for 3 minutes. Add all remaining ingredients, mix well and throw it in the oven at 350 for about an hour. If you like a slightly thicker stew mix half water & half flour until it’s smooth and pour it slowly into the stew about 10 minutes before it’s cooked.